I've hosted three events over the last week where trouble and conflict was expected, but none came. I'd be flattering myself if I said this was because I established such a force of firm control, but there are ways to encourage debate without it getting testy. Our speaker at a private dinner on Wednesday night was Tehsin Nayani. If you've never heard of him, that's his intention. For six years he was the PR man for the Glazer family. You could say he did a lousy job. That would be harsh, but he certainly had his hand tied behind his back with owners who simply didn't want to engage with public or media. As a result, the American owners of Manchester United have never improved upon their relationship with the fan base at Old Trafford and long periods of their ownership have been punctuated with protests and discontent. Tehsin gave us some fascinating insights into who his bosses were, what they were like and how the club is run. In his book The Glazer Gatekeeper, he explains just how frustrating his job was at times. He's no longer a spokesman for the owners of Man United, but clearly retains a respect for them and stoutly defended their tactics and strategy of ownership at Old Trafford. Did everyone leave convinced? Probably not. Did the guests of KPMG, NorthEdge and Rowan Partners manage to enjoy ourselves without falling out about it? Very much so, as Ron Manager would say. I was delighted to be asked to open Manchester Policy Week on Monday. Arriving early I was surprised to see burly security guards on the doors to the room inside the Manchester Museum. The debate I hosted was on fracking, with an illustrious panel of geologists and climate scientists and for good measure, a senior executive from exploration business Cuadrilla, which seems to attract protestors like moths to a flame. We used electronic clickers to gauge the opinions of the audience - 70 per cent were against. By the end that number was reduced to 60 per cent (a mixture of latecomers and waverers). Interestingly, the argument against fracking from Kevin Anderson of the Tyndall Centre is almost solely concerned with the end product, not the means. It's more hydro-carbons and that's enough to want to block any further gas extraction. Anyway, no protestors but a very robust and high quality debate as you can read on the Policy Week blog. Last Saturday I took a trip to the seaside for Labour's North West conference where I was hosting a fringe meeting on how we can make Britain fairer in the next five years. As I said on my blog for the think tank Progress, there is a twin track approach needed here of community leadership and ultimately campaigning for Labour to be in government, wherever that may be. 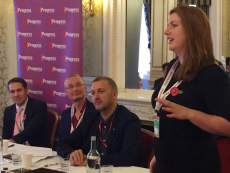 There is a golden thread of sanity through the Labour party that is exemplified by how we govern - Jim McMahon, the leader of Oldham and selected to stand for parliament in the Oldham West by-election is one - but also MPs like Alison McGovern who are thinkers and active campaigners. There is talk about conflict in the party, but I only detected a steely pragmatism. The advice I gave to Young Labour activists who didn't get elected to officer roles on Saturday was to just get on with the task in hand, put ideological differences aside and work for the people who need us. Sure, there will be ripe language and rule bending. Yes, some of them were a little shaken up, but that's politics, it can be a rough trade. So, such variety and no bother. I do think it's important to maintain that safe and free space to express views and opinions. I saddens me that Universities are closing down debate and extending the dubious "no platform" policy beyond where it was ever intended. We're in the process of programming our 2016 Discuss series and I would dearly love to host debates on whether Islam needs a renaissance, why Manchester isn't as good as it thinks it is and the relevance of feminism. I ought to point out that my agent, Nicky Wake of Don't Panic is taking bookings for conferences, debates and awards nights.